Couldn’t resist getting a picture of the book with this forsythia. I love Jane Eyre with the fiery passion of a thousand suns. It was one of my favorite books growing up—my mother read it aloud to me when I was nine or ten—and I’ve read it every few years ever since. I love it for the reasons everyone else does: Jane’s fiery temper and cool intellect, her passionate emotions and unfailing sense of what is right and wrong. I love how much she craves justice. The world is flooded with bildungsroman about boys and men, but Jane Eyre is in my book the best of the genre. 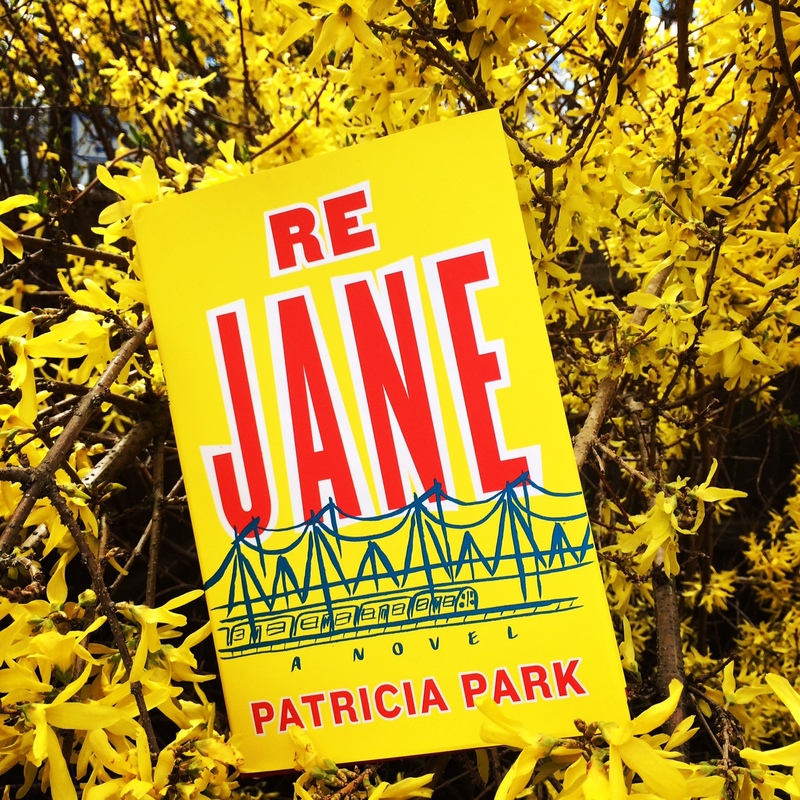 Patricia Park’s Re Jane* (coming May 5, but I just couldn’t resist writing about it now) is a modern reimagining of Jane Eyre that pays homage to its predecessor while carving its own path, one that shines with wit. It’s 2000. Jane Re lives in Queens with her uncle, aunt, and cousins, working in her uncle’s store after a job offer in finance fell through. Adrift, and bereft of her best friend, who’s going off to work at Google (and who needs her own book–she’s delightful), she decides to accept an unconventional offer: to work as a nanny for the Mazer-Farley family in (pre-hipster) Brooklyn. Jane is smart, organized, hardworking, and flailing under the weight the differences that separate her from her family: she is an orphan, and she is half Korean, half American, treated coldly, if not cruelly, by her traditional-minded Korean uncle. With the Mazer-Farley’s Jane feels the weight of nunchi (a principle of deference to one’s elders out of obligation that results in a great deal of non-verbal etiquette to follow) lifting, but finds other problems: struggling through the feminist readings assigned by the well-meaning but oblivious Beth Mazer; helping her very bright pupil (adopted from China, she has all of Adele’s mischief with none of her preciousness) negotiate the social complexities of school; and falling for Ed Farley, a gruff but thoughtful English teacher with a knack for midnight snacking. The novel follows Jane from Flushing to Brooklyn to Seoul and back to Queens again as she charts a difficult course to discovering who she is and what she wants, not only in terms of love and family, but identity and career as well. Readers who love Jane Eyre will appreciate all the touches that recall the original novel, from names to recurring phrases (and the title of a certain scholarly work that pulled from Jane Eyre itself), and will recognize the structure of the plot. However, Ms. Park does not adhere to strictly to its outcomes and characters do not follow a 1:1 correspondence (though her rendering of St. John Rivers is particularly strong ), which was a wise choice. I couldn’t stop turning pages, wondering what Jane would do or think next. While the novel is particularly attentive to issues of ethnicity and class, it never takes itself too seriously. I delighted in the wit on display—the book includes a wonderful send-up of academia and, shall we say, the wheatgrass-and-tote-bag type–and references to geek culture that pepper the novel. And I loved the fascinating look at Korean culture that Ms. Park provides, which made me want to visit Seoul (she traveled to Korea on a Fulbright some years ago, and her blog about the experience was wonderful, though I don’t think it’s online anymore). If you’d like a brief non-fiction sampling of some cultural differences she encountered, you can read this essay in Brevity. Re Jane is a compassionate and thoughtful (and feminist!) retelling of a beloved classic that deserves to be read for its own numerous merits. I can’t wait for Patricia Park’s next book. Boston readers: Patricia Park will be at Harvard Bookstore on May 11 at 7pm, in conversation with Margot Livesey. Get there! I was just thinking about Jane Eyre on my walk with the dog this morning, and what it is about it that I love so much. You have just reminded me of all the good things. And, now this new one if going on my list (I think I also have one called Texts From Jane that I read about on your blog- how do they compare?). OK, I’m going to have to read this one. Let’s just say it. The buildingsroman focusing on boys and men is DUN DUN DUN. I have to admit this new book sounds pretty interesting, but alas, no time for it. I have to read “H is for Hawk” first, introduced to me by this blog. After I finish Bill Bryson’s “A Short History of Nearly Everything” (introduced to me by Half Price Books) which is too delightful to put down.